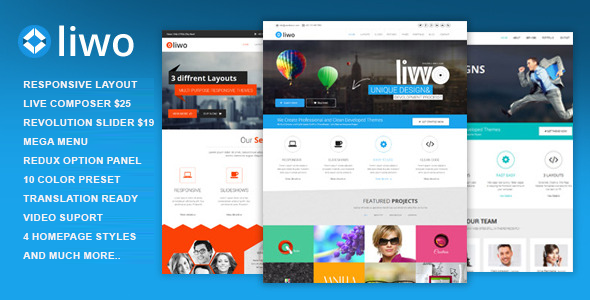 Liwo is a 100% Responsive WordPress Theme(Desktop, tablet, mobile phone…) simple, clean and professional theme. It is Unique, Awesome Slideshows, Unique Color Variations. Easy-to-customize and fully featured design. This theme suitable for Company, Business, Blog and Portfolio. Create Outstanding Website or Blog in Minutes! Liwo is Working together with Live Composer – An amazing layout builder, video support! We include the detailed documentation on how to use the theme and it’s features and almost 1h of screencast on our YouTube channel. Plus you can always submit a ticket at our help desk if you have any queries.